I want to thank you for following this blog, we’ve had over 600,000 views now and I am absolutely humbled and grateful to have your readership. For those of you who find yourself having to retake the bar exam, do not lose heart. You CAN do it. I will be writing as much as possible this weekend and in the coming days about: 1) about what to do if you have recently failed the bar exam, 2) how to deal with the addition of Civil Procedure to the MBE exam (as you probably know, the NCBE has added Federal Civil Procedure to the MBE effective on the February 2015 bar exam), and 3) how to pass the bar exam while working a full time job and/or raising a family (yes, it is possible . . . many of my students just did that on the July 2014 bar exam). These are the major issues as I see them for those of you who are confronting the February 2015 bar exam. If you are a repeat taker, then you likely can not take much time off of work, or you may not be able to take any time off from work to study. As a result, it will be very important to figure out a study plan that will work around your work and/or family responsibilities. It can be done. And, if you are repeating the bar exam, you may very well have taken Barbri (this isn’t a dig or jab, just the reality – most first time takers take Barbri) and you have a “free retake” . . . so the question for some of you becomes whether you should retake what did not apparently work for you the first time around? The answer to that question isn’t the same for everyone. I will be writing about this soon – hoping to give you some advice as to how to tailor what you might already have at your disposal and ultimately pass this very next bar exam. Again, thank you for following this blog and stay tuned for more. 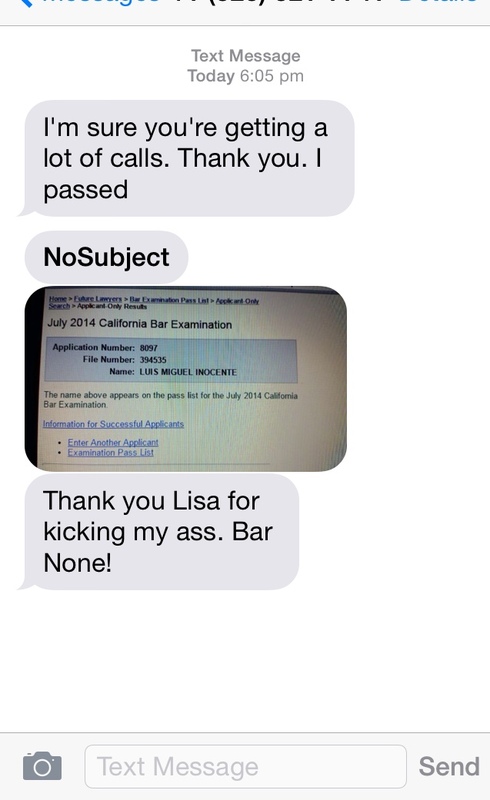 Here are a few messages from some of our July 2014 bar exam students. I passed!! Thank you so much 🙂 with one daughter and a baby on the way you helped me pass the bar and were so positive! I got my money back from that other horrible tutor too. Really appreciate your help. Thank you! Previous California Bar Exam: We’ve added a second workshop date!